Entertaining, Food and Always Fun! Hello all! This post was meant to be up last week but with Irene causing all sorts of problems here on the East coast I am finally getting around to it today! So, my last post was about pickles and this post is about a pickling experiment that actually turned out well. When I was out in California 3 years ago for my nephews wedding we went on a winery tour and not only was there great wine but lots of yummy treats. One of those treats was spicy pickled green beans-they were delicious! My nephew keeps threatening to send us some or bring them when he visits but has yet to do so. When I was making the pickles I decided why not try it with green beans and just add some red-hot pepper flakes?! And they are great! Now, I know that some of you are wondering why didn’t I just go buy them? Well, I couldn’t find them anywhere in New Jersey until, of course I decided to make them myself. 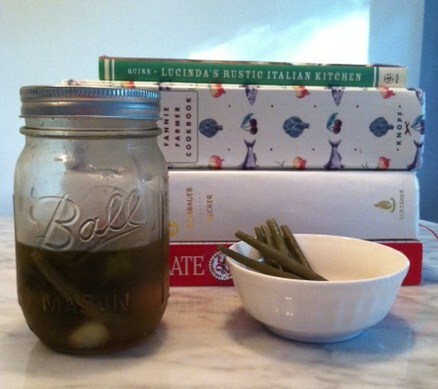 Basically, use the same recipe as the pickles but use pint Mason jars and green beans. I used about 1/4 teaspoon of red pepper flakes and they were only slightly hot, I would use more next time. I also didn’t cook the green beans and got different opinions on whether I should or not, about 50/50. My next batch I’m going to blanch them for about 2 or 3 minutes, it just depends on how crunchy you want them. They are a great addition to an appetizer spread, game time munchie or added to a martini or bloody mary! Thanks for reading! Enter your email address to subscribe to Set the Table and receive notifications of new posts by email.